On a recent visit to the Milledgeville / Eatonton area of GA I found myself staring at two historical markers marking the location of the town of Blountsville. On Nov. 18, 1864, Blair’s 17th Corps of the Right Wing of Gen. Sherman’s army (USA), which had left Atlanta on Nov. 15th on its destructive March to the Sea, crossed the Ocmulgee River at Seven Islands (12 mi. NW of Hillsboro) and marched via Monticello and Blountsville toward Gordon. The more direct roads were already crowded with the troops and trains of the 15th Corps and Kilpatrick’s cavalry division. If one were to Google Blountsville GA today - there is one additional link to a usgwarchives post which is informative about the town - which apparently was the home of many prominent Georgia families, and more than one educational institution. Other than "It suffered severely..." I found no information about what happened to it, or when it ceased to exist exactly. Standing next to the two markers at a crossroads today, a passerby will see not one trace of this town - not a chimney or the remnants of a building of any kind can be seen - just the forest. I'd be very interested in any information about the fate of this town. Unfortunately he says nothing other than that they passed through it. Of the march in general he says that enemy opposition was "comparitively nothing" (next page) and that "forage parties, as organized with orders from the army commander, kept the troops well supplied." He mentions the destruction of railroad track and bales of cotton, but nothing else. Blountsville was near Clinton in Jones County. Clinton Suffered a lot of damage during the war. Rebecca Larimer Felton mentioned how troops camped out in front of the house they refuged too. You can see this town has been around since 1820. Considering most North Georgia Cities dod not come about until after the Cherokee land lottery in 1832. Blountsville probably shared the faith of many communities during the March to the Sea. Sounds like Blountsville was still around in September, 1865. Like a lot of towns it eventually passed on. Clinton, Blountsville, Etowah, Cassville, etc etc. as example they never quite revived after the war. Correct, I don't know that whatever destruction that was caused during the foraging during the MTTS couldn't have been repaired..I think it was like many small towns in the deep south that could just never financially recover after their way of life was completed uprooted and the majority of the population fleeing and many not returning post war. This can be seen throughout MANY towns from North Georgia all the way through to South Georgia. Many once prominent rail/stagecoach towns simply couldn't recover because the new times and technologies didn't really need them to anymore. The describes events before the fall of Atlanta - and well before Sherman's March to the Sea. It describes a raid deep into the state. I wasn't aware of large raids to this part of the state until Sherman's stroll through GA after the fall of Atlanta. What raid would this have been? Many other activities - see the site for details. Love this thread! I live very close to Blountsville and have tried to find info. There is a small family cemetery a couple of miles down the road from the markers, it holds 5 family members that were killed during the Tornado Enigma of 1884. So it appears the village of Blountsville was still around in 1884. The article also mentions a church was destroyed, not sure if that was the church run by the Rev. Milnard. Apologies for the lack of proper formatting, since I am a new poster the system kicks back posts with too much formatting as it seems to trigger the spam filter. Jones County. From Mr. W. A. Davidson, of Jones county, who came in for five coffins for one family, we learn something of the destruction caused by the cyclone in Jones. At Blountsville, six miles from Haddock's Station, the storm came up at about 4:30 o'clock. In an instant houses were blown down, fragments being carried great distances. Mr. W. A. Miller, who lives near Blountsville, was at his brother-in-law's, about a mile away, when the storm came up. On going home he found the house gone and on the ground lying at considerable distances from each other the dead bodies of his wife and three children. One child was blown away and the body had not been found up to the time Mr. Davidson left. Six negroes were also killed, their bodies being literally torn to pieces. The church was also blown away. 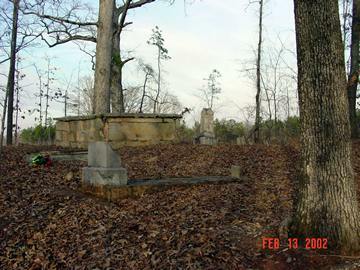 The tall gravestone seen on the right of the photo is engraved on all four sides with the names of the buried children. Wow, just came across this thread on Blountsville. My Grandmothers Uncle is the William Andrew Miller that those graves are associated with. He was in the 42nd GA Regiment and his father Andrew Jackson Miller was living in Decatur at the time of the 1884 Cyclone. The town was mostly wiped out during the war and some of the plantation housed remained. The house of William's Uncle (Jeremiah Kinchen Miller) is still there and the owners just showed my cousin a bullet hole that was fired by Sherman himself when he stayed in the house. I just found photos of William and added them to my Geni account. He married the sister of his dead wife and had more children. Their names are all added by me. Also, the Hurt family from the area was the same family that owned the Troup Hurt house and the Macintosh Hurt house where the Decatur railroad led away from Atlanta and where the Jimmy Carter Presidential Library sits today. My Great Great Grandmother is Elizabeth Hurt. The red brick house in the Cyclorama painting shows the battle around one of the homes.